Games often rely on our base curiosity. Our drive to prod what’s around us and see the results. For some games, it’s enough to push you through it, but for others, where you’re playing as an authored character, it isn’t. These games want to tell stories. Stories need certain things, and without them, there’s no reason to care about what unfolds. In games, that turns into not having a strong reason to move forward, other than to do what almost every game lets us do: finish it. But simply finishing a game isn’t satisfying the way that good stories are. It’s just an empty feat. 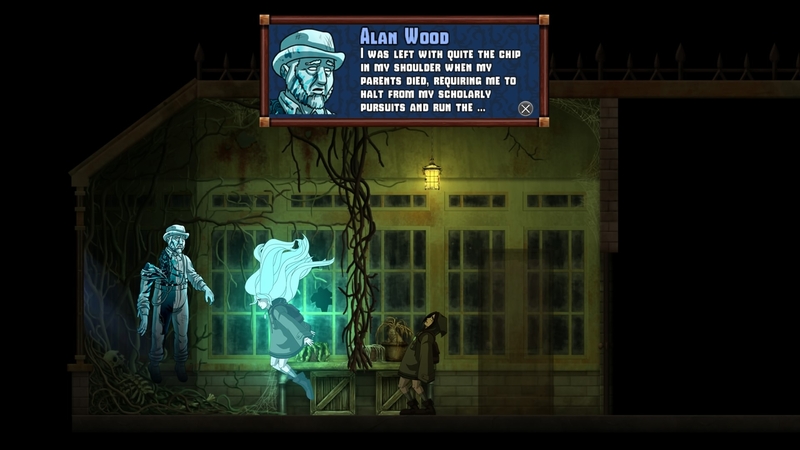 Whispering Willows seems like an adventure game that would have liked to avoid that, but it focuses on a main character who spends the entire time wanting something you can’t empathize with. Elena wants to find her father who has disappeared from his job as a groundskeeper at a haunted mansion. Throughout the game, she repeatedly says as much, but you’re never given a better reason to explore the blood-stained walls of the mansion — and a few other buildings — other than the familial tie. That’s not enough to justify walking through graves, running away from demons, and talking to ghosts. And it doesn’t help that doing those things at the game’s sluggish pace has little influence on the narrative. Elena creeps through the estate as if the horizontal, 2D rooms had visual meaning worthy of contemplation. “A male bust, that’s funny, right?” Clever observation, Elena. Instead, the rooms only look dilapidated and barren. They’re rarely even representative of the man who had them built, a character that the story ultimately focuses on. Instead, they are unrealistically constructed as find-the-key puzzles for Elena and her spectral form to solve. Ghost Elena slides through conveniently-placed holes in the walls to clear a path for her body. And, at any time, you can revert back to your human form. These actions are never used for more than basic exploration and backtracking. You find a key, and then try to remember what door it goes to, or else suffer several minutes of laborious searching. For some reason, Whispering Willows made transforming into a ghost mundane. It wouldn’t be so dull if your journey felt consequential, but Whispering Willows’ haunted buildings offer no surprises. You’re told to fetch an item and you do. There’s no narrative wrinkles to consider. Everything happens just as it was laid out. The lack of conflict and resolution, the fundamental parts of any good story, make everything you do as Elena feel stale. The story that only tangentially involves your interaction is much better, though that’s not saying a lot. You frequently find journal entries from various, historical perspectives on the malicious man that owns the estate, including his own. The taste of nuance these notes give to the man, named Wortham, suggests developer Night Light Interactive understands what makes good characters. While a little rote, Wortham’s selfish, murderous path after losing a loved one is compelling enough for the game to use him as a character that resonates with the game’s theme. Elena meets those he killed and hears their side of the story before eventually confronting him. And when it happens, you’re invested because of what you know and what he doesn’t. It’s almost tragic that the game uses characterization and conflict to craft a better narrative than the one that takes up most of its length; especially since, for the majority of the game, you wish you could stop playing and read all of the notes like a short story. The journals aren’t even found in particularly notable places either. They’re scattered like collectible coins to give you a jolt of satisfaction in an otherwise drab experience. And for that, they’re effective. But they’re are also a constant reminder of the main story’s inadequacies. That’s not to say that a story presented this way wouldn’t work. Whispering Willows treats its tale as a standard mystery, where Elena is the catalyst for a series of plot reveals. But in any other medium those revelations happen without your input. Because it’s a game, it requires you to empathize with Elena’s choices enough to fuel your drive to play it, to drag yourself through a series of artificial barriers that seem to exist because it’s a game and that’s what games do. But when you’re playing a character that chooses to do all the things you can make her do, she should have understandable reasons to do them. Elena doesn’t, and that numbs most of the game. 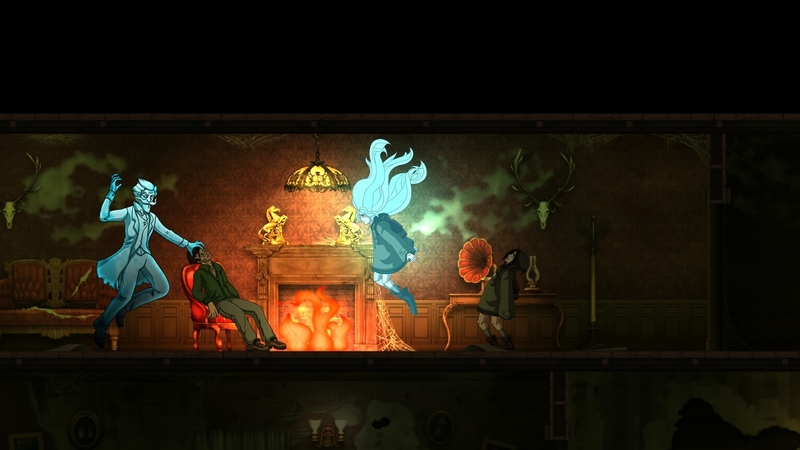 I don’t think Whispering Willows intended for me to ask myself why I needed to keep playing for the majority of my time with it, but it did. It’s the kind of game that lacks satisfying substance, the kind of game where all you can say is that you finished it. Whispering Willows review copy provided by publisher. For more information on scoring please see our Review Policy here.